An artificial left leg with a thigh socket for amputation above the knee. Photograph (circa 1920). Courtesy of Wellcome Library, London under a Creative Commons License (Museum No A500465). Charles Manby Smith (1804–80) was a writer fascinated by and deeply concerned with the position of “cripples” in Victorian society. In the second edition of his most famous work Curiosities of London Life: Or, Phases, Physiological and Social, of the Great Metropolis (1857), a study of London street life that has been compared to Charles Dickens’s Sketches by Boz(1833–36) and Henry Mayhew’s London Labour and the London Poor (1851), he expresses particular anxiety for those maimed by “commerce” (referring to labourers injured by industrial machinery), who, according to him, were given little support and “left to fight the battle of life at fearful odds” (17). The “tale of adventure” “An Essay on Wooden Legs, with Some Account of Herr Von Holtzbein” (first printed in the April 1854 edition of Tait’s Edinburgh Magazine and later published in a volume with Smith’s novel The Dead Lockin 1863), on the other hand, presents the amputee as curios whilst playfully gesturing toward the enabling potential of human prosthesis. In a perspicuously ironic manner, the narrator of “An Essay on Wooden Legs” goes beyond identifying prostheses as devices that can enable amputees to live normal lives, suggesting instead that such technologies are capable of enhancing a user beyond the limits of normalcy. As the narrator explains, “it is my present purpose to reconsider a question which I fear has been too summarily settled, without duly weighing the arguments which have been, or might be, adduced on both sides—the question being, whether TWO legs are better than ONE” (emphasis original; 247). According to the narrator, the use of an artificial leg not only lessens the chances of the user contracting illnesses or defects, such as gout, corns, and bunions, but also prevents damp feet and the risk of sustaining injuries as a result of doing things too quickly. It also, according to the narrator, provides some physical advantages, such as providing a better footing on soft ground. To exemplify his argument, the narrator also tells the story of Herr Von Holtzbein—the name in German literally means “wooden leg”—, a Berlin-based war veteran, who after losing his leg to a bullet-wound in the Napoleonic war, “cured the ills that fighting flesh is heir to by applications of wood and steel, and leather and whalebone and cork, all so elaborately made and so perfectly simulating nature's handy-work, that his reputation, amateur though he was, surpassed that of the first professors of the day” (254). After Von Holtzbein’s daughter gets engaged to a fellow veteran’s son, the prosthesis maker breaks off the engagement because of an off-hand comment made by the young suitor regarding the inferiority of prosthetic limbs to their organic equivalents. Only after the suitor has an accident himself—resulting in amputation and the chartable offering of an artificial leg by Von Holtzbein—is the relationship between father and son-in-law-to-be restored. Herr Doppelschank, the suitor, is thus only enabled to marry the successful prosthetist’s daughter (thus raising his status and, presumably, his finances) once he is himself adorned with a prosthetic limb. While the tone of Smith’s “tale of adventure” is obviously ironic, what is significant is that at no point are inorganic-looking prostheses privileged over human legs. Indeed, Von Holtzbein’s legs are described as being so impressive exactly because they “so perfectly simulat[e] nature's handy-work” (254). In this sense, then, while the author light-heartedly champions the durability of wood as a replacement for “elastic flesh and sinew” (248), he resists advocating a prosthetic device that looks mechanical or inhuman. The tale is therefore comical, rather than radical. The artificial limb is suggested to be more durable and resilient than the organic, but quietly nature’s design goes unquestioned. While the author is happy to mock the material flaws of the organic leg and also the supposed ingeniousness of contemporary artificial legs, he nonetheless privileges the appearance of the natural limb. This restraint reflects a wider Victorian acceptance of prosthetic technology on the condition that it resembles human form and masks the disability of its user. Indeed, as Vanessa Warne and others have identified, artificial legs (like the one displayed in the image above and those produced by Von Holtzbein) were seen as distinct from and were privileged over peg legs (worn predominantly by lower class characters such as Silas Wegg from Dickens’s Our Mutual Friend) in the Victorian period since they possessed superior mimetic capabilities and better disguised middle-class and aristocratic users from appearing maimed. Then the man of one leg, it must not be forgotten, is the possessor of certain physical advantages to which the biped is for ever a stranger. He is exempt by law from all personal participation in the turmoils and brutalities of war. A man of peace by Act of Parliament, he never incurs the disgrace of running away, or is laughed at for avoiding a combat by shewing what he has not got “a fair pair of heels”—though if by any aggression he is driven to his shifts, he can, upon an emergency, find a footing where the greatest hero upon two legs could not make a stand. Or he may cross a steam dry-shot where another would get up to his knee in water, simply by plunging his insensible substitute in the middle, and transferring the natural limb to the opposite bank. [. . .] Moreover, in cases of emergency, when it becomes necessary to put the best foot foremost, he is never hesitating and at a loss, like your bipeds, being at no pains on deciding between the leg which cost him nothing, and that which has cost him perhaps from ten shillings to ten pounds, as taste or circumstances may have led him to the adoption of the convenient cork, the patent spring, or the unsophisticated but manly stump, in the choice of a pedestal. I might enumerate many other advantages which contribute to his exclusive enjoyment, were I so disposed, but I scorn to accumulate evidence in favour of a truth which the reader must by this time be ready to admit, and shall proceed, as in fairness bound, to notice the objections that may be urged by prejudiced bipeds against his fortunate condition. A Scottish phrase literally meaning “to ride on Shank’s mare”. To “shank” is “To set off smartly, to walk away with expedition” (Jamieson 342). In this context, then, Smith means merely to walk with great haste. See Jamieson, John. Supplement to the Etymological Dictionary of the Scottish Language. Vol. 2. Edinburgh, 1825. Like nowadays, men wishing to enlist in the British Army faced a medical screening. If an applicant did not match certain physical requirements, he was not offered an enlistment (which were typically for ten or twelve years). For more on British Army enlistment, see Skelley, Alan Ramsay. The Victorian Army at Home: The Recruitment and Terms and Conditions of the British Regular, 1859-1899. Montreal: McGill-Queen’s University Press, 1977. There was in fact a huge difference in price between top-of-the-range artificial legs (such as those made by British prosthetist Frederick Gray and the Americans Frank Palmer and A. A. Marks) and peg legs, which were produced by carpenters, cabinet makers and doctors as well as by prosthesis specialists. Mexican political leader Antonio López de Santa Anna, who lost his leg fighting the French in 1839, is said to have purchased two high-tech wooden legs from an American cabinet maker for a staggering $1,300 a piece. By contrast, in 1888 A. A. Marks charged just $10 a piece for his cheapest peg legs. For more on nineteenth-century British currency, see Marje Bloy’s “British Currency before 1971” on The Victorian Web. Gray, Frederick. Automatic Mechanism, as Applied in the Construction of Artificial Limbs, in Cases of Amputation. London, 1855. Available online at archive.org. Mihm, Stephen. “A Limb Which Shall Be Presentable In Polite Society: Prosthetic Technologies in the Nineteenth Century”. eds. Katherine Ott, David Serlin and Stephen Mihm. Artificial Parts, Practical Lives: Modern Histories of Prosthetics. New York: New York University Press, 2002. 282–299. Print. Warne, Vanessa. “‘To Invest a Cripple with Peculiar Interest’: Artificial Legs and Upper-Class Amputees at Mid-Century”. Victorian Review 35.2 (2009): 83–100. 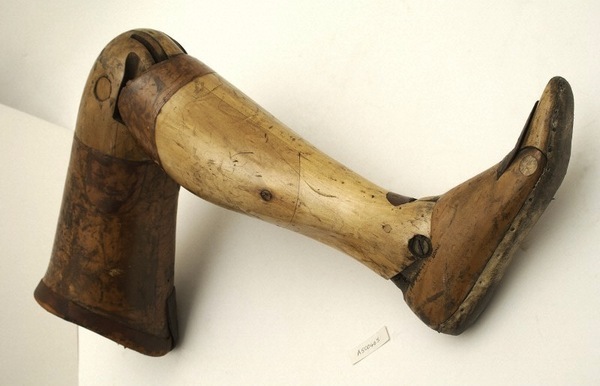 Smith, Charles Manby, “An Essay on Wooden Legs, with Some Account of Herr Von Holtzbein,” Nineteenth-Century Disability: Cultures & Contexts, accessed April 23, 2019, http://nineteenthcenturydisability.org/items/show/24.